Fernando de Szyszlo’s relationship with OAS art program dates back to the time of his first solo exhibition at the OAS art gallery in 1953. Szyszlo subsequently worked at the OAS as a consultant for the Visual Art Unit in 1958, and went on hold two additional solo exhibitions at the OAS AMA, 1985 and 1996. Ten of his works—murals, mixografias, and easel paintings—has found homes in the OAS art collection. This exhibition features seven of these works, a documentary film on the artist produced by the OAS Audio Visual program, and archival material on his solo shows at the OAS. Due in large part to AMA’s founding director José Gómez Sicre’s enthusiasm for Szyszlo’s work from the time the artist was barely known, and the long-term working relationship that the two shared, AMA’s art archives contain many rare materials that shine a light onto nuances of the artist’s life and career. 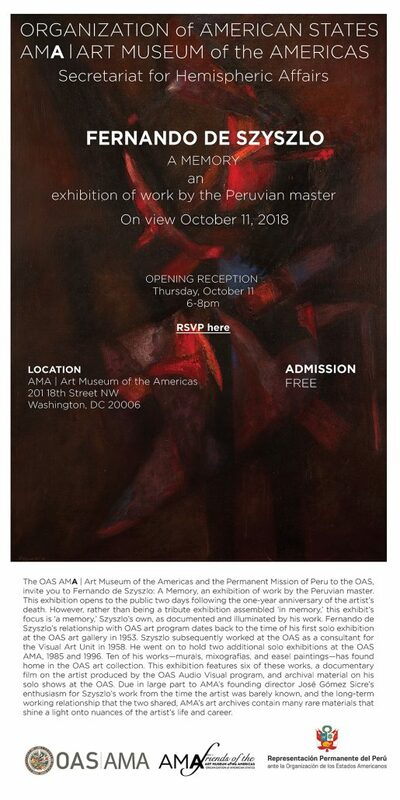 AMA’s archives, devoted to the collection and preservation of papers and other records related to the art and artists of the Americas with particular focus on Latin American and the Caribbean, are generally accessible to researchers by appointment; for this exhibition, selected papers will be on view in the museum.